It’s well known that Bermuda has a high cost of living. Almost nothing is produced on the island so everything needs to be imported (mainly from the US). Transport costs, customs duties, and high labour costs increase prices considerably. Bermudians and expatriate workers pay the price for living on such a beautiful island. Rents, utility prices, vehicle running costs, insurance etc. cost significantly more than in the US and most other western countries. 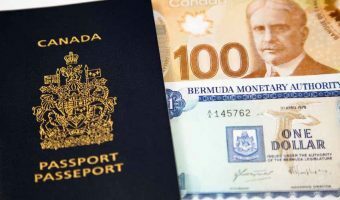 On the other side of the coin, people living in Bermuda generally enjoy high wages (average household income at the time of the last census was over $100,000). They also benefit from extremely low tax rates. If you’re visiting the island as a tourist, you’ll almost certainly have paid a lot for your flight and hotel (or cruise). Additional costs aren’t that bad though. Groceries are considerably more expensive, but transport costs and prices for activities and attractions are pretty much in line with the US (in many cases cheaper). We looked at things a typical tourist may spend money on while visiting the island (groceries, meals, attractions tickets etc.). Prices were compared to their equivalent in New York (where many visitors are from). Prices were valid in July 2013. The cost of food and groceries in Bermuda is considerably higher than in the US. We made a random selection of grocery products in a mid-range supermarket in Bermuda. We then compared their costs to those of the same items in a similar store in New York. If you’re a cruise ship passenger you shouldn’t really be too concerned about grocery prices. You’ve already paid for meals on your ship and are unlikely to be doing any cooking! If you’re staying in accommodation with cooking facilities you can save a bit of money by bringing some groceries with you. Bathroom tissues, 12 rolls 10.65 Typical cost in US would be about $8. Branded chips, 139 g tin 2.50 Typical cost in US would be $1.90. Cereal, 12.2 oz 5.45 Typical cost in US would be $3.70. Cheese slices, 12 pack 4.09 Typical cost in US would be $3.40. Eggs, 1 dozen 3.39 Typical cost in US would be $2.50. Ice cream, 48 oz. 9.55 Typical cost in US would be $5. Laundry detergent, 50 oz. 10.95 Typical cost in US would be $8. Pasta sauce, 30 oz. 3.71 Typical cost in US would be $3. Pizza, 12 inch 14.59 Typical cost in US would be $7. Yoghurt, 6 oz. 1.39 Typical cost in US would be $0.90. Gasoline costs over twice as much in Bermuda as it does in the US. Despite this, taxi fares in Bermuda are cheaper than in New York. Hire a scooter (there are no car rentals) and you probably won’t even notice the cost of gasoline. They’re fuel efficient and do around 100 mpg. Bear in mind it’s only 22 miles from one end of the island to the other. Transportation passes are great value and allow unlimited travel on buses and ferries at all times. The 7-day pass costs roughly the same as its New York equivalent. Gas, 1 gallon 8.10 Average cost in the US would be $3.67. Scooter rental, basic model, 2 days 122.00 $86 plus $36 repair waiver. Taxi fare, LF Wade International Airport to Hamilton (1 – 4 people) 27.00 Flat fare from JFK to Manhattan is $52 plus surcharge. Taxi fare per mile (1 – 4 people) 2.25 Standard fare in New York is $2.50 per mile (more in slow moving traffic). Transportation pass, 7 day 56.00 7 day NYC MetroCard (valid on subway and express buses) costs $55. There are a lot of free tourist attractions Bermuda. You could spend a few weeks here and not see them all. There’s also a good selection of free events you can attend (Harbour Nights, Bermuda Day etc.). Prices for the attractions you need to pay to enter are extremely reasonable. Bermuda Aquarium, adult ticket 10.00 Adult ticket for Central Park Zoo costs $18. Bermuda Fun Golf, adult 15.00 Adult ticket for Pier 25 Miniature Golf, Hudson River Park, costs $5. National Museum of Bermuda 10.00 Adult ticket for MoMA costs $25. Prices in restaurants and bars are generally higher than in the US. However, you could easily pay the same prices at comparable establishments in New York. If you’re a cruise ship passenger, you’ll probably eat most of your meals on the ship. There are no truly inexpensive fast food restaurants in Bermuda. There was once a McDonald’s but it closed many years ago. Newspaper, Royal Gazette 1.00 New York Times costs $2.50. WiFi access, TBI, 3 days access 14.99 Wireless internet access with TBI. Hotspots in Dockyard, Hamilton, and St George. Other periods available e.g. 24 hours for $9.99. Price is considerably cheaper than you’ll pay on the cruise ship.